Port Washington, NY /PRNewswire/ -- Pall Corporation, a global leader in filtration, separation and purification, has announced a strategic partnership between its Pall Biotech business unit and Aetos Biologics, a biosimilar cell line development company. The companies will collaborate to offer biosimilar manufacturing solutions to the global biosimilars market. 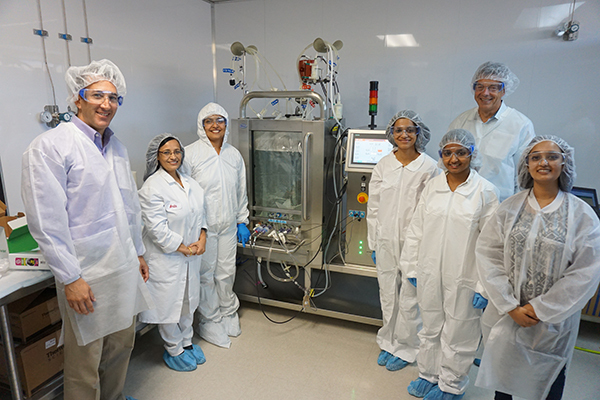 Pall Biotech will provide access to next generation bioprocess equipment, such as the Allegro™ STR Single-use Stirred Tank Bioreactor for good manufacturing practices (GMP) manufacturing, and consumables to enable efficient biosimilar production. Aetos Biologics will provide high-quality/high-titer cell lines, and scalable manufacturing processes. "Biosimilars are a replication of a successful biopharmaceutical product. While they are much less expensive than innovator molecules, the complexities in their development make it critical to work with the right equipment and service providers," said Mario Philips, VP & General Manager at Pall Biotech. "We are excited to partner with the Aetos Biologics team to advance the market impact of biosimilars and deliver lower priced, high-quality options to end users." "Our team is constantly working to optimize a growing pipeline of high-yield biosimilars with outstanding quality," said Amita Goel, founder and CEO of Aetos Biologics. "Through this strategic partnership with Pall Biotech, we can ensure that the exceptional quality we achieve in scaled-up processes is efficiently transferred and reproduced by the client." By aligning Pall Biotech equipment, including bioreactors, mixing and storage, and downstream technologies with Aetos Biologics' cell lines and manufacturing processes, customers benefit from access to integrated solutions for expedited biosimilars development. Pall Corporation is a filtration, separation and purification leader providing solutions to meet the critical fluid management needs of customers across the broad spectrum of life sciences and industry. Pall works with customers to advance health, safety and environmentally responsible technologies. The company's engineered products enable process and product innovation and minimize emissions and waste. Pall Corporation serves customers worldwide. For more information visit www.pall.com. Located in the heart of the San Francisco Bay Area in California, Aetos Biologics has assembled a formidable gene to product team comprised of seasoned industry veterans experienced in biosimilar development, manufacturing, clinical trials, global regulatory requirements and successful commercialization. Aetos Biologics serves partners engaged in commercialization of biosimilars for the global market. For more information visit: www.aetosbio.com or email info@aetosbio.com.